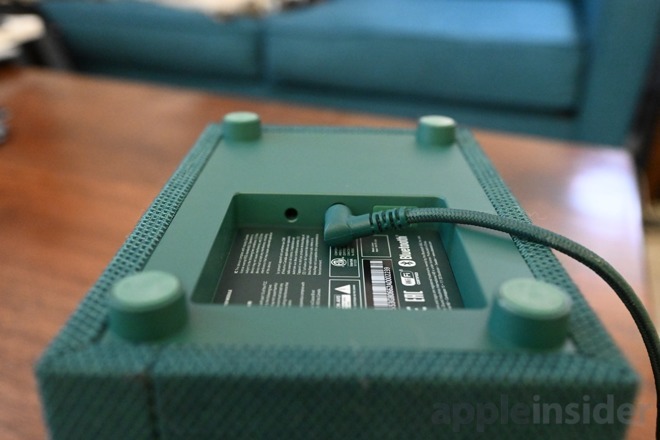 We've seen many retro-inspired speakers — such as the excellent Marshall lineup — so it was refreshing to see a different take on an in-home speaker. Loosen goes for a minimalist and slightly modern look with a boxy design and striking colors. Our Lotsen is "Plant Green" but Vinyl Black, Dirty Pink, Concrete Gray, Indigo Blue, and Goldfish Orange are also available. The entirety of the exterior is wrapped in a soft-touch fabric for a consistent look, with the controls prominently on top. Four rubber legs elevate the speaker about a half inch from the supporting surface, which is just enough for the power cable to eke out. Speaking of, the power cable is color-matched to the speaker itself and is removable — and replaceable — should the need arise. Even better, the cable is nylon-wrapped giving it a more premium feel at this lower price point. Just like the exterior, UrbanEars kept the controls simple. A pair of multi-function knobs atop allow you to play/pause/change inputs or switch between output modes/adjust volume. They have a finely tuned amount of tension as they rotate and emit a satisfying click when depressed. What's missing from the speaker is a microphone, which means no virtual assistants or the possibility of implementing one in the future. As such, if you connect over Bluetooth, you also can't use Lotsen as a speakerphone. UrbanEars has loaded up the Lotsen with many ways to get your music playing. Most notably for us is AirPlay — though no AirPlay 2. 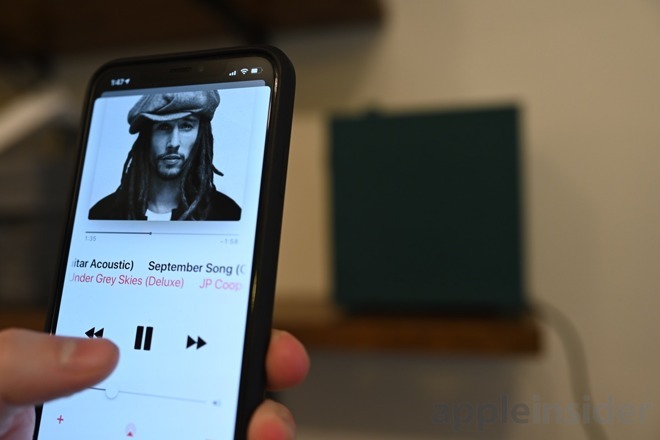 Chromecast, Spotify Connect, and Bluetooth are also options. Hidden under the bottom by the power input is a 3.5mm aux input for those going the wired route. Seven presets can be configured to jump between which don't require your phone at all after setup. 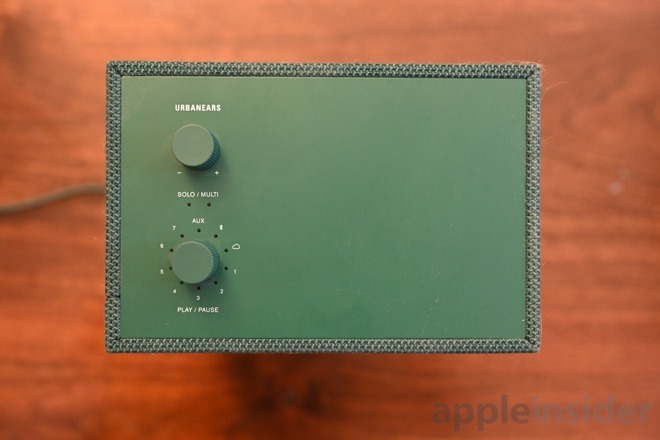 These presets can be playlists or internet radio stations that you choose within the UrbanEars Connected app. These weren't a huge help to us but for those who do rely on playlists, it is great to start jamming how you want, with no phone necessary. This all said, pre-set stations can take a few seconds to load when accessed, but this wasn't a sticking point for us. Packed within this small 7.6 x 4.53 x 6.77-inch box is a four-inch main woofer and an accompanying one-inch tweeter. This is nothing over-the-top, but the package makes the Lotsen quite capable of putting out quite a bit of sound. It was able to fill the downstairs floor of my townhome, although it wasn't going to knock anyone's socks off, demonstrating more solid background music than ground-shaking tunes. Specifically, bass is sufficient, but not exceptionally deep. Comparing it to the Sonos Beam soundbar we just reviewed that lacks a standalone sub was even able to push out more bass, and the HomePod — notoriously bass heavy — blew it away. As the volume gets low, the bass nearly disappears, leaving bass-heavy tracks such Here Comes the Hotstepper. There was a bit of hesitation on the high end, leaving songs such as Glitter and Gold a bit weak rather than the normal edge that is present on premium audio devices. Almost as if it hit a wall and couldn't quite get out those crisp cymbal hits quick enough. At max volume there starts to get a bit of distortion, which isn't too surprising given the max volume it can crank out. We didn't go that high more than a handful of times in our small testing environment —but limits are good to know. Early on we mentioned the toggle knob on top that could switch between solo or multi modes. This is how quick and easy it is to go between listening to the Lotsen by its lonesome versus together with any of the other multi-room Urbanears speakers. This could be a second Lotsen, the larger Stammen, or the even bigger Baggen. Once set up, just pressing the knob puts it into multi mode, linking up any speaker also in that mode. There is no finagling or worrying about AirPlay menus, just press the button and boom. We have to admit this works easy enough and only had minor issues and dropouts in our testing. If you are thinking it may be annoying to travel to each room to switch the toggle, luckily you can make the change from the Urbanears Connect app as well. UrbanEars Lotsen is a nice speaker. It has above average sound compared to Bluetooth streamers, a simple design, and the unique ability to store a variety of presets we don't see with many other speakers. Audio fidelity definitely has its misses, but for a sub-$200 speaker with multi-room capabilities, it makes its mark. 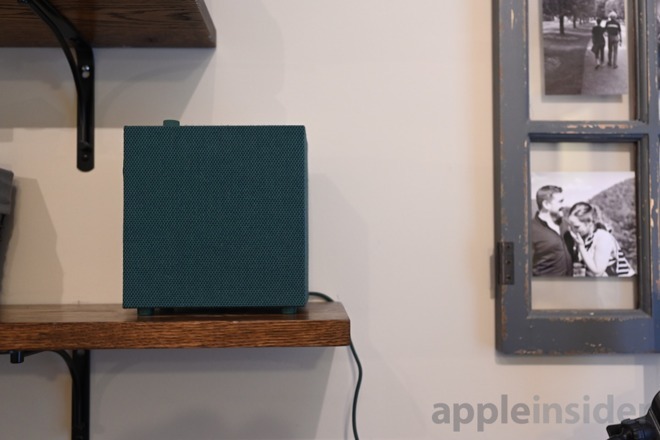 If we had one thing to change, we'd have preferred to see AirPlay 2 but with their own multi-room solution they didn't see the immediate need, though it could always be delivered in the future should that change. AirPlay 2 does have other benefits than just multi-room support after all. Lotsen is available from Amazon for $199 in any of the six colorways.